Serifos island in Greece. Beaches. Villages. Accommodation. Ferries. Hiking. Serifos is a quite small island in area, 73 km2, making it the thirteenth largest island in the Cyclades, and about five times smaller than Naxos, which is the largest island in the Cyclades. The highest mountain Troulos measuring 583 metres above sea level. Geographically Serifos is located in the western Cyclades, the nearest neighbouring islands are Sifnos and Kythnos. About 1,400 people are permanent inhabitants, most of them lives in Livadi (600 inhabitants) and in Chora (360 inhabitants). The main occupations are fishing, agriculture and tourism. Secluded Serifos is something of a mystery. Why are there so few island hoppers travelling to Serifos, and so many that are travelling to the neighbouring island of Sifnos? It's a pity, Serifos is similar to Sifnos and should attract more tourists. The island has a number of nice beaches of different character, here is a landscape that really is calling out after hikers, people are curious and hospitable, and the calmness that exists on Sifnos do also exist on Serifos. 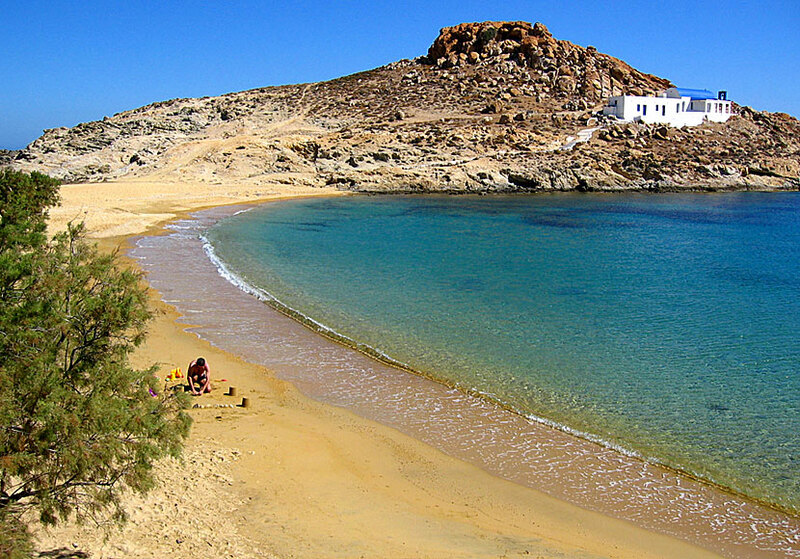 Agios Sostis is one of several child-friendly beaches in Serifos. When you first arrive at Serifos, it is difficult not to be impressed by the wonderfully beautiful village of Chora perched on the top of the hill above the port. It is one of the Cyclades most beautiful villages if you ask me. In short, Serifos is an island longing to be discovered. One category of travellers who really should appreciate Serifos is families with children seeking serene islands with beachfront accommodation and child-friendly beaches. 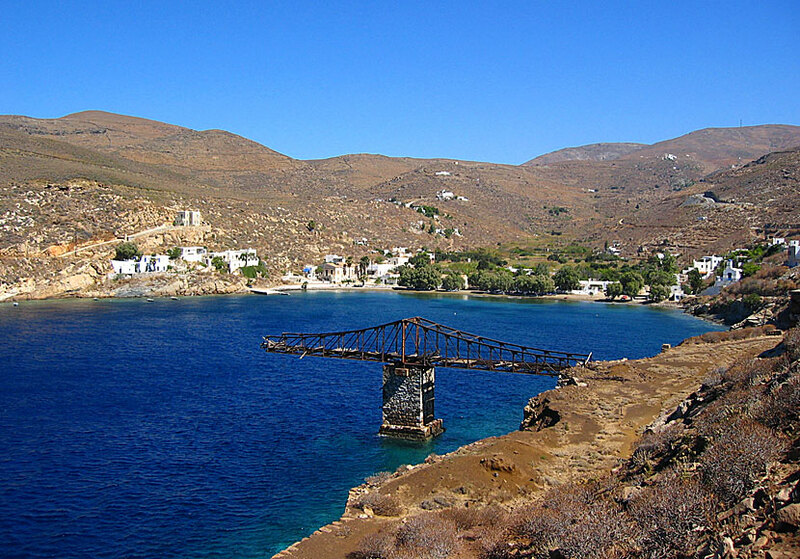 Serifos was an important island in the mining industry for many years ago. It still remains several interesting monuments from that time, especially in Megalo Livadi. Other attractions are the many dovecotes and the small picturesque villages of Panagia and Galani. Make a visit to one of the villages and you are transported to another period. The island's main attraction is, as in many other islands, a monastery. On Serifos it is called Moni Taxiarchon and a visit is highly recommended. Megalo Livadi is a very interesting village. The best time to visit Serifos is April and May for the beautiful scenery, June when it is not yet so many tourists, and in September when the evenings are temperate and the water is invitingly warm. Serifos revive from mid-July to late August thanks to all vacationing Italians and Greeks. It can be difficult to find good accommodation at reasonable prices and it may even be difficult to get a table at the few tavernas. View of Livadi and Livadi beach seen from Kastro in Chora. Behind the hill on the right lies Livadaki. Serifos is not open to mass tourism and most tourists travel here independently. It is easiest to fly to Athens and continue by ferry from Piraeus. There is departures with regular ferries and catamarans every day from Piraeus during high season. Another option is to go by air to Santorini, from where ferries runs to Serifos a couple of times a week depending on the season. Serifos' villages are without exception a part of Serifos' authenticity. Even the island's largest tourist resort Livadi (see picture at the top of the page) has a noticeable Greek everyday life. Chora is one of the island world's most picturesque villages. Other villages are Livadaki, Panagia, Galani, Kallitsos and Megalo Livadi. 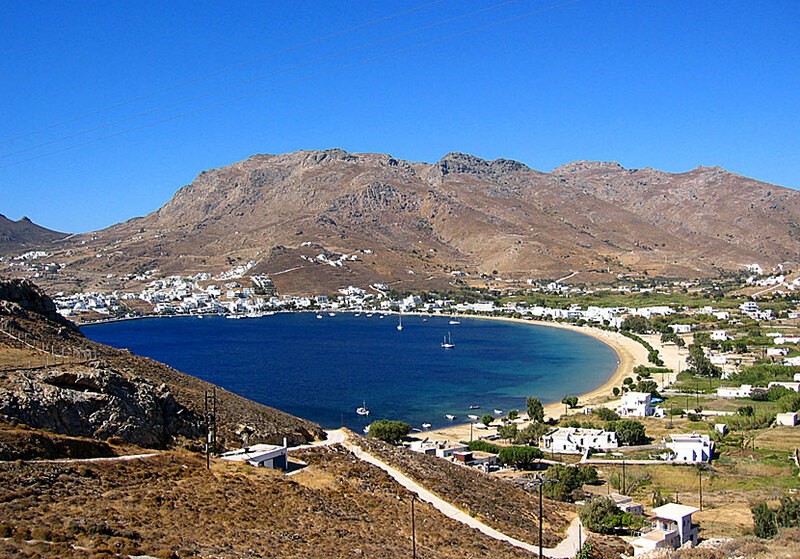 Serifos can brag about some really good beaches with wonderful sand and seductive waters. My favourites are Lia and Agios Sostis. Other beaches are Ganema, Koutalas, Agios Ioannis, Livadi, Psili Ammos, Vagia and Sykamina. Serifos do almost not have what we usually call sights. There is not much to see, apart from the Monastery of Taxiarchon. Well, Chora should of course not be missed, and not either the vestiges of the mining industry. Almost all tourists stay in Livadi or Livadaki. There are few accommodation options in the other villages. 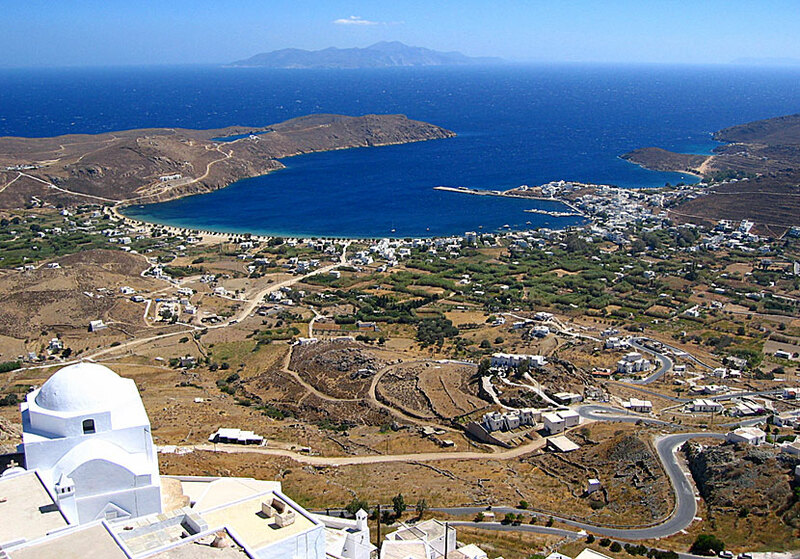 But it does not matter, because Serifos is a small island and the distances are short.